A new age of exploration dawned at the start of Run 2 of the Large Hadron Collider, as protons began colliding at the unprecedented centre-of-mass energy of 13 TeV. The ATLAS experiment now frequently observes highly collimated bundles of particles (known as jets) with energies of up to multiple TeV, as well as tau-leptons and b-hadrons that pass through the innermost detector layers before decaying. These energetic collisions are prime hunting grounds for signs of new physics, including massive, hypothetical new particles that would decay to much lighter – and therefore highly boosted – bosons. In these very energetic jets, the average separation of charged particles is comparable to the size of individual inner detector elements. This easily creates confusion within the algorithms responsible for reconstructing charged particle trajectories (tracks). Therefore, without careful consideration, this can limit the track reconstruction efficiency in these dense environments. This would result in poor identification of long-lived b-hadrons and hadronic tau decays, and difficulties in calibrating the energy and mass of jets. Similar to increasing the magnification of a microscope, in preparation for Run 2, the ATLAS event reconstruction software was optimized to better resolve these close-by particles. As a result, at angular separations between a jet and a charged particle below 0.02, the reconstruction efficiency for a charged particle track is still around 80% for jets with a transverse momentum of 1400 to 1600 GeV in simulated dijet events. This has maximised the potential for discovery, allowing for more detailed measurements of the newly opened kinematic regime. 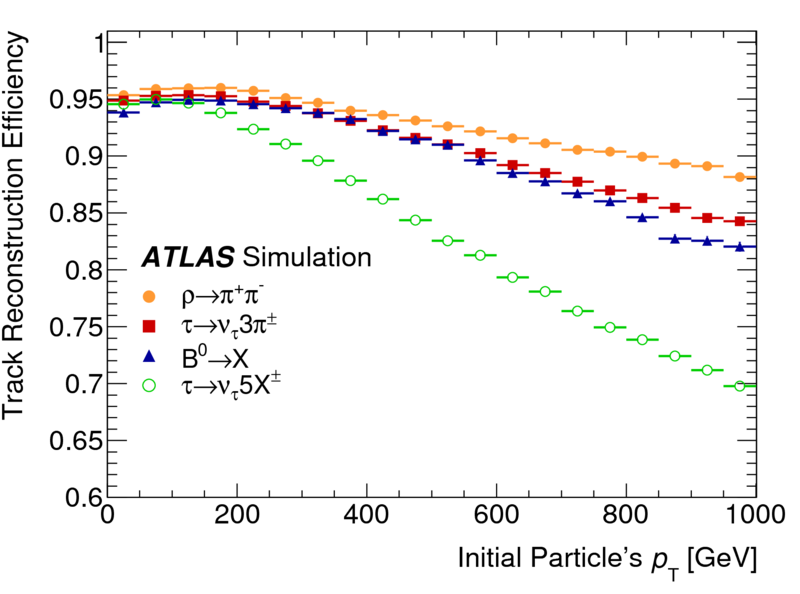 Similar to increasing the magnification of a microscope, in preparation for Run 2, the ATLAS event reconstruction software was optimized to better resolve close-by particles. 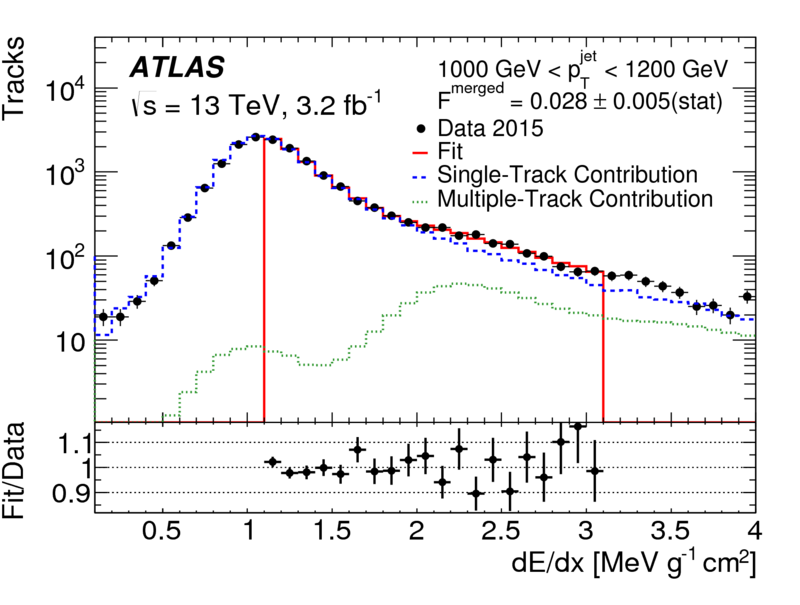 Recently published results give a general overview of the new track reconstruction algorithm, highlighting the ATLAS detector’s excellent performance in reconstructing charged particles in dense environments. The results also present, for the first time, a novel method for determining in situ (i.e. from data) the efficiency of reconstructing tracks in such an environment. The study uses the ionization energy loss (dE/dx), measured with the ATLAS pixel detector, to deduce the probability of failing to reconstruct a track. The obtained results confirm the excellent performance expected from studies on simulated data. Performance of the ATLAS Track Reconstruction Algorithms in Dense Environments in LHC Run 2 (arXiv: 1704.07983, see figures).